Tender baked chicken with a delicate orange ginger glaze and topped with flavorful stir fry sauce served atop healthy brown rice with colorful vegetables. Orange Ginger Chicken Baked Stir can be prepared ahead in about 2 minutes — 3 minutes tops! Let it marinate all day (or longer if you want to make it the night before) in the refrigerator. Come home at night, take the marinated chicken out of the refrigerator, pull the frozen packages out of the freezer, fill the baking pans while the oven preheats. Microwave the rice and portion out premade salad while the chicken and veggies bake. Bingo! Complete dinner in twenty minutes. Fast, easy AND delicious! Stir fry vegetables are found in the frozen vegetable section. They are a mix of peppers, sugar snap peas, broccoli, cauliflower, carrots, onion, mushrooms, water chestnut or any similar combination. Pick the kind that fits your taste and budget. Size of package varies according to brand so buy enough for at least six servings. I don’t like to have a collection of sauces waiting in the fridge for use in only one dish. Stir fry sauce can be used to flavor rice so drizzle some over the microwaved rice and add a bit of butter. It can also be used to add pizazz to vegetables,and, of course, for easy stir fry. Pour some of the extra marinade over the chicken before baking to keep it moist. The high oven temperature will cause it to boil long enough — 1 to 2 minutes — to destroy any baddies. However, you’ll need to discard the rest of the marinade. Never save marinade to use another time. Better safe than sorry! You can use a jelly roll pan, 14×18 inches to bake chicken and vegetables together. For me, it was easier to use two pans as written in the directions. 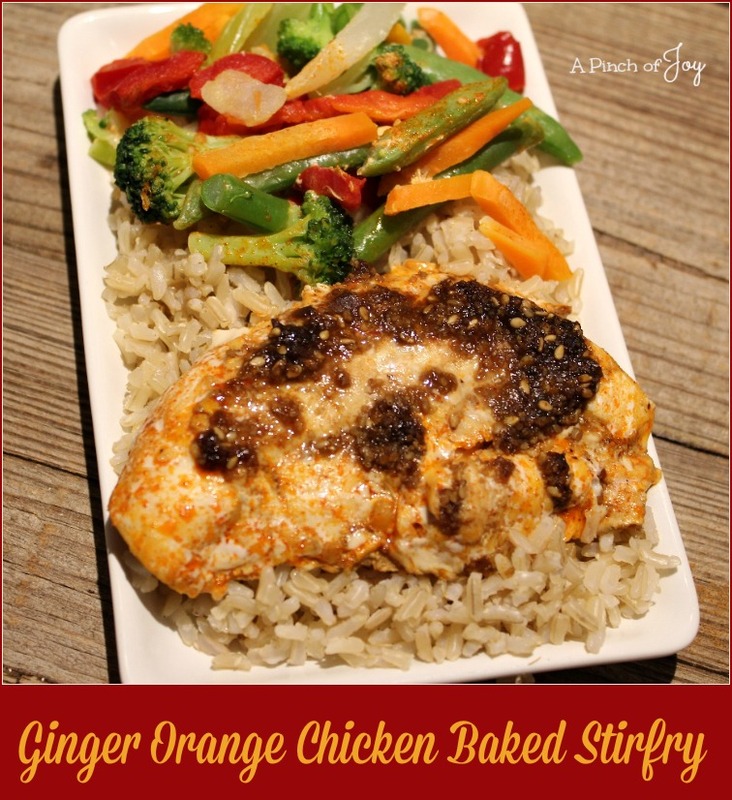 Tender baked chicken with a delicate orange ginger glaze served with veggies atop a bed of brown rice. A quick and easy meal for busy families! and pepper. Set aside 2-3 tablespoons in refrigerator and pour remainder into bag. Seal and shake to coat chicken with mixture. Let marinate for several hours or overnight. For chicken: Spray a rimmed cookie sheet with cooking spray. Place chicken in pan. Season with paprika, garlic powder, salt and pepper. In small bowl, mix together stir fry sauce, soy sauce, orange peel and ginger and spread over chicken. Sprinkle sesame seeds over chicken. Place in oven. Roast for 15-17 minutes until done. Chicken should be 165 degrees. For vegetables: Spray a 9x13 pan with cooking spray. Spread frozen stir fry vegetables evenly over pan. Drizzle with reserved orange ginger sauce. Place in oven. Roast about 15 minutes. Serve vegetables and chicken atop rice.